ESET®, a global pioneer in proactive protection for more than two decades, announces the latest release of its secure access solution ESET Secure Authentication. ESET’s mobile-based solution brings two-factor authentication (2FA) to businesses by transforming each user’s mobile device into a trusted personal authenticator. With the addition of support for Microsoft Remote Desktop Protocol, this latest edition of ESET Secure Authentication becomes the most compelling 2FA solution on the market. Verizon’s 2014 Data Breach Investigations Report confirms that the use of stolen or misused credentials – user name and password – are still the most common way by which cyber-criminals gain access to sensitive company data. Two out of three breaches exploit weak or stolen passwords, making the case for strong 2FA. By relying on existing Active Directory infrastructure and security mechanisms, ESET Secure Authentication minimizes total cost of ownership for organizations without compromising on security. Deploying the solution on Remote Desktop Servers is seamless and, thanks to the great user experience, also significantly reduces the time and effort required by administrators and service providers to deploy the software. Compatible with all versions of Windows Server from 2008 R2 up to and including the Windows Server 10 Technical Preview, ESET Secure Authentication protects both licensed Remote Desktop Session Host servers as well as native, license-free Remote Desktop connections. The latest version of the software also includes new features targeted at administrators of larger and more complex networks. ESET Secure Authentication is no longer limited to deployment in single-domain forests, and may now be deployed in multi-domain and multi-forest networks. Now it also allows administrators to keep track of all 2FA-enabled users by automatically categorizing them into the referential Active Directory security groups that are created during installation. 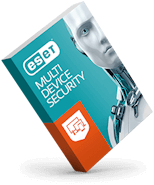 ESET Secure Authentication combined with the New Generation of ESET IT security products for business, launching in Q1 2015, creates strong double-layered protection for your company’s remote access infrastructure.